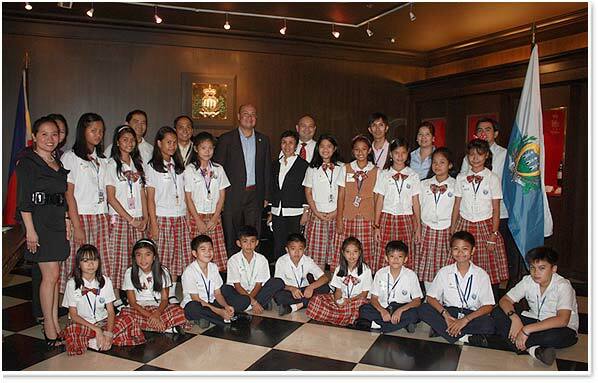 February 23, 2010 – The Consulate office of the Most Serene Republic of San Marino in the Philippines conducted a San Marino Cultural Awareness Day with selected grade five students from Jesu Mariae International School in Paranaque. Consul General of the Republic of San Marino to the Philippines Mr. Jean Henri Lhuillier personally welcomed the students and teachers to the consulate office. He introduced San Marino to the students as the oldest Republic in the world. Ms. Viola Go-Clanor presented a number of significant facts one should know about this oldest Republic. Afterwards, the guest students had fun playing interactive educational games. During the storytelling activity, the students were told about St. Marinus, the founder of San Marino and to make their stay in San Marino more memorable, each of the students was given a token that will remind them of San Marino and their educational yet fun filled visit at the Consulate.